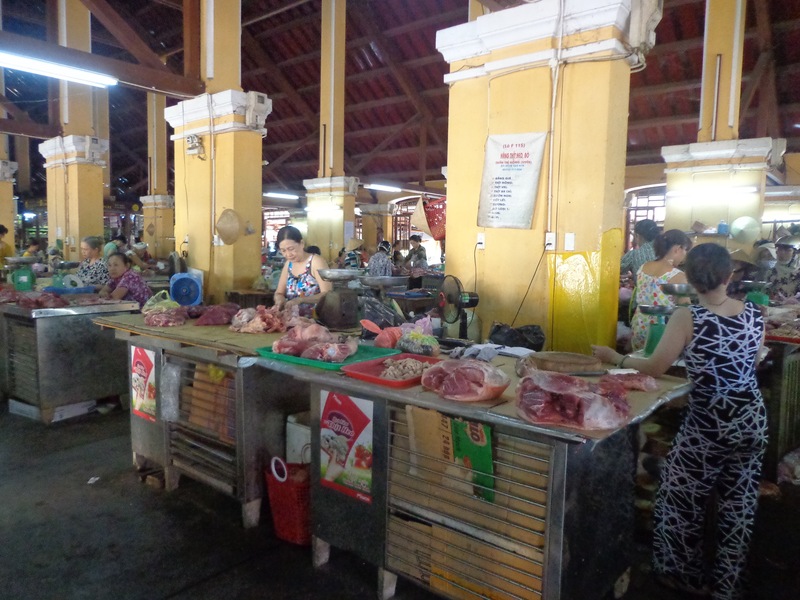 Hoi An market is a daily grocery and meat market that does business between 6.00 am to 6.00 pm. Most meat and grocery shops are inside a large building. The green groceries are sold outside the building on the footpath. Thu Bon river passes beside the area. Fresh catch of the day is sold underneath a large thatched shelter that borders the river. It is best to reach there early in the morning when the mercury isn’t about to bust through the capillary of the thermometer. After that, park your vehicle somewhere safe and explore the entire area on foot. 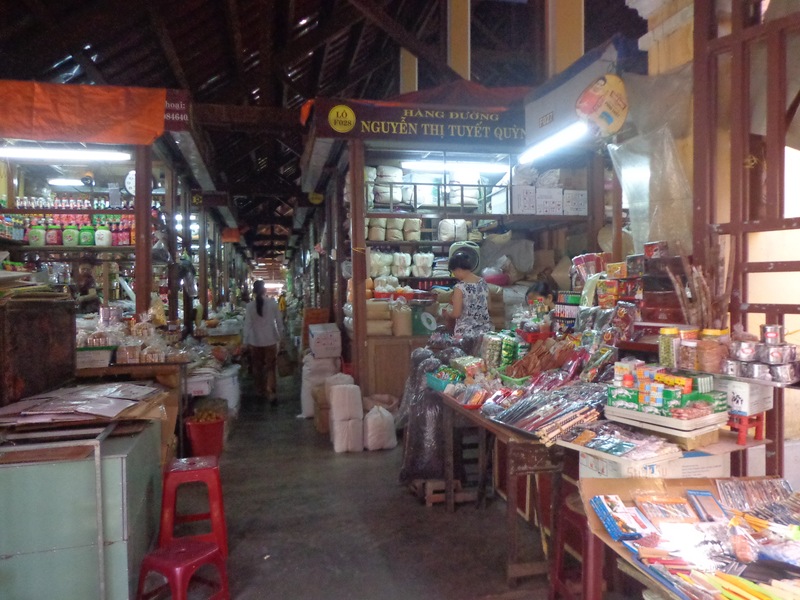 The front section of Hoi An central market sells grocery. It looks much like New Market in Kolkata. The rear side of the building houses the meat shops. 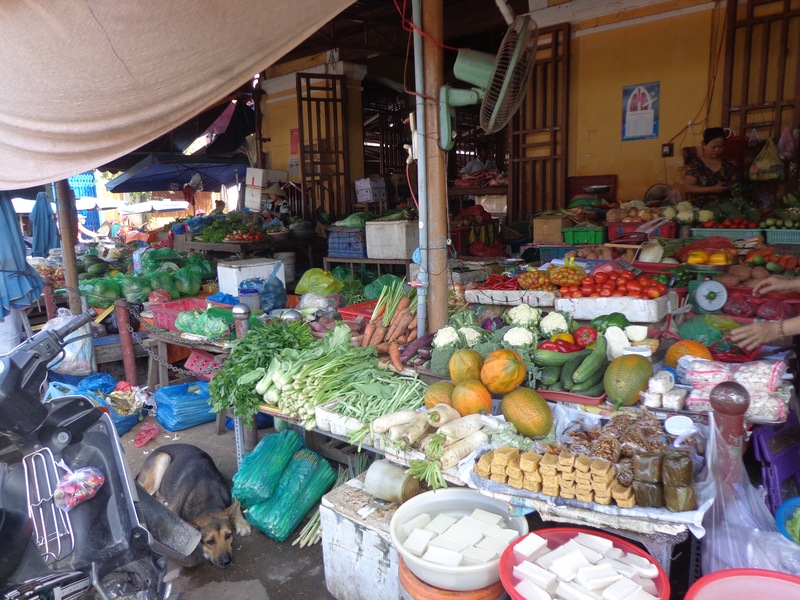 Fruits and vegetable shops are lined up outside the market building, spilling into the pavement. We Bengalis are used to such scenes in our local fish market. Nearly 99% of the shopkeepers were women. I wonder what the men do. 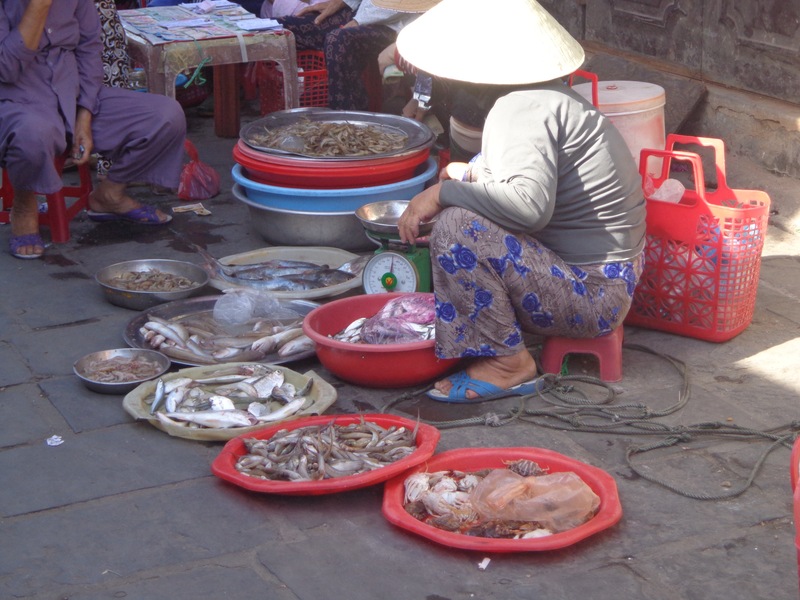 There are many places to visit that lie in the vicinity of the central market. We entered two of them just because they came in our way of commute. A shrine commemorating the death of 108 Hahn merchants in the sea in 1851. 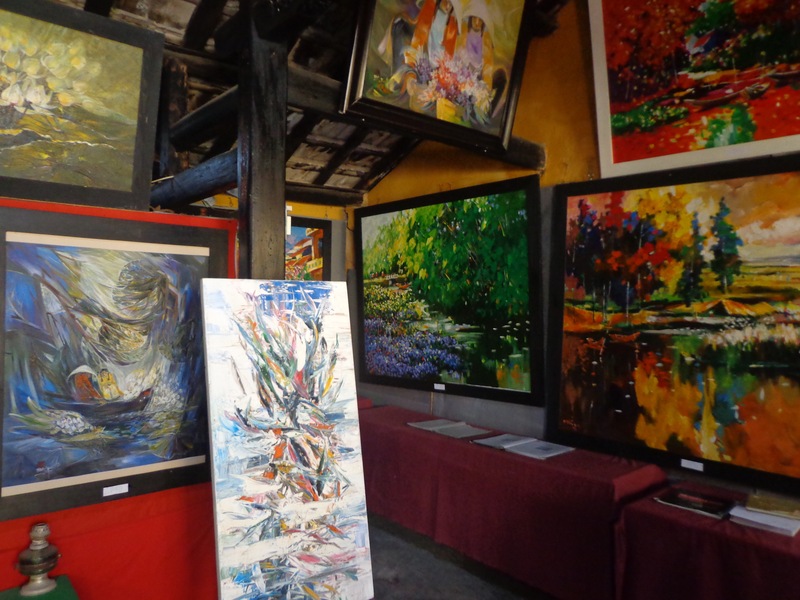 The Hoi An art gallery contains many paintings by renowned and up coming Vietnamese artists. 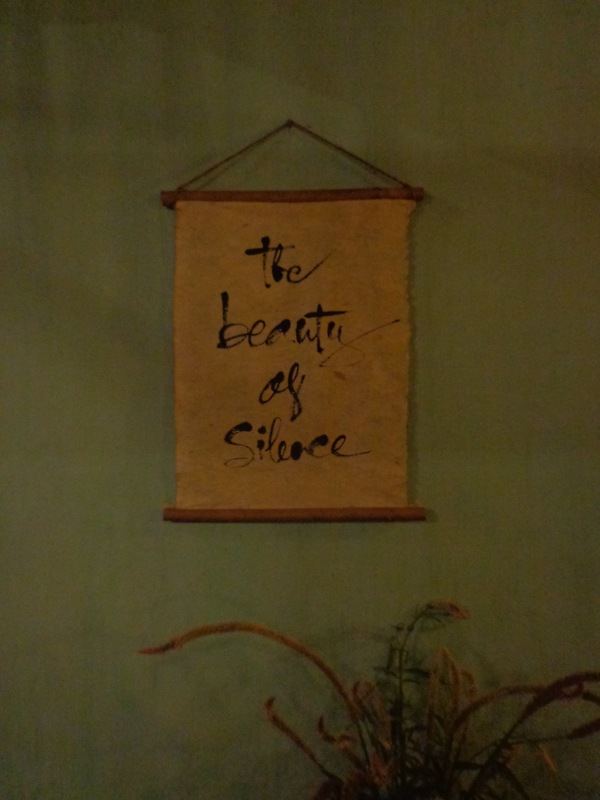 This small gallery can be easily missed amidst the chaos of central market. 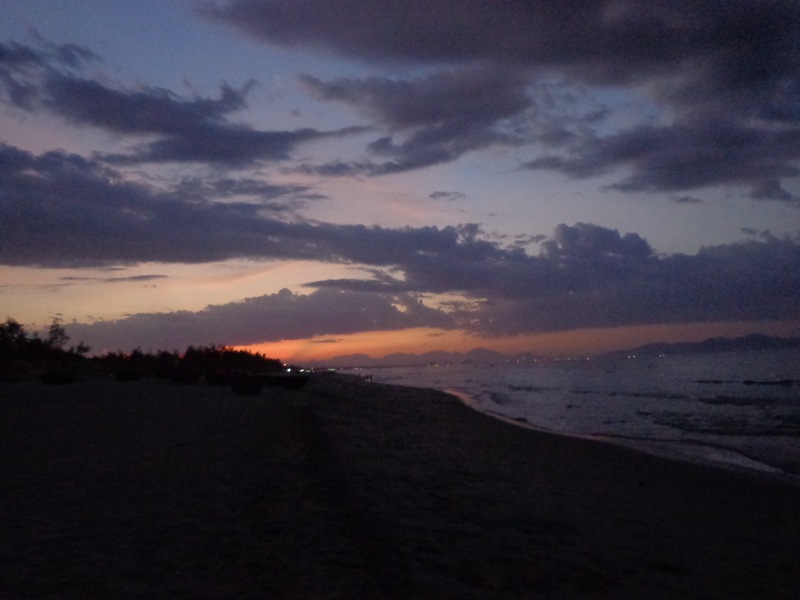 There are two main beaches in Hoi An – the Cua Dai beach and the An Bang beach. However, there is a third one that is not advertised much. It is hard to figure out its location unless someone gives you a pointer. If you are like me and would want to stay away from the din and hustle of tourists flocking in the most hyped places, this beach is for you. We went there after the sunset and spent quite some time sitting on reclining chairs. If you want to reach this place, here are the co-ordinates, 15°54’20.7″N 108°21’10.8″E. 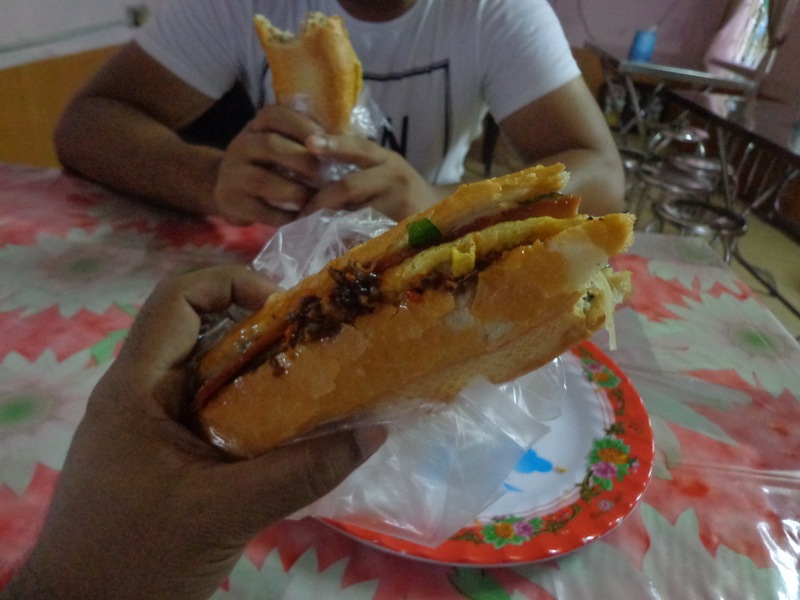 Bahn Mi is a submarine sandwich that is very popular with the Vietnamese. Most likely it was made after the French colonisation of Vietnam. The sandwich bread is hard and looks like a miniature baguette. The filling varies from location to location and from outlet to outlet. 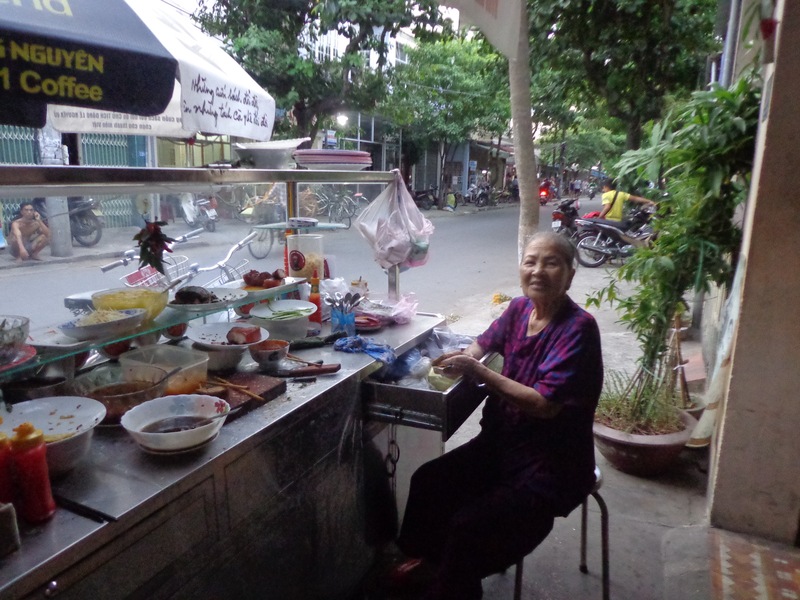 An old lady, Madam Khanh runs a small roadside joint called “The Bahn Mi Queen”. Her Bahn Mi has a lot of ingredients. I could make out omelette, pork slices, ground beef, caramelised onion, lettuce and mint. There would be at least another four or five items that I had no clue about. This is a Bahn Mi. The standard American sub can’t even come close to its flavours. The Bahn Mi queen in front of her roadside workstation. Not many Indians travel around these places. That’s why a lot of Vietnamese people stop and ask us where we are from out of sheer curiosity. 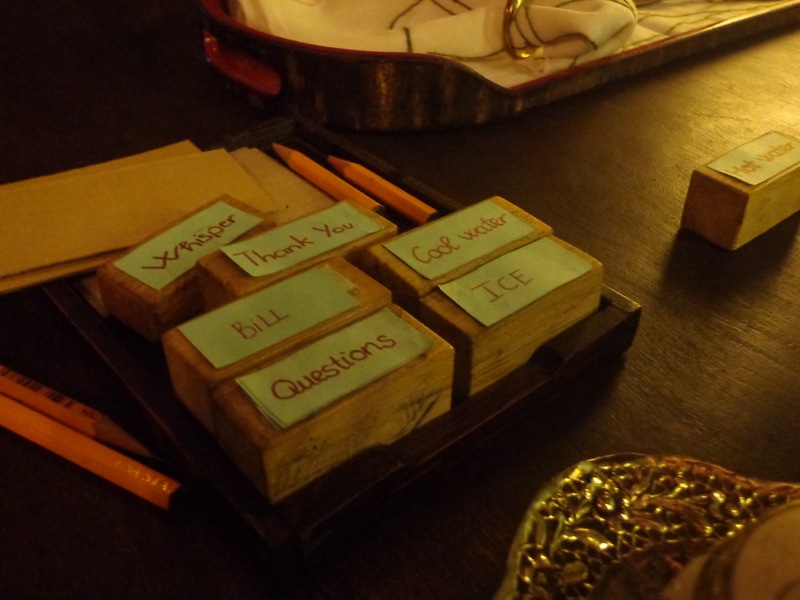 This was one instance where the owner showed us two notes left by past Indian travellers who praised the food. We did not leave a note but left a word of gratitude. 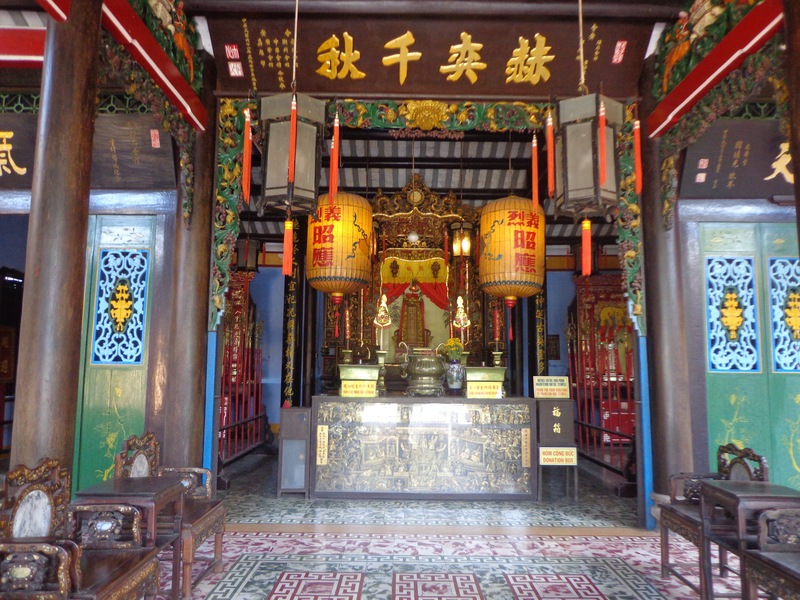 Inside the ancient town of Hoi An, the quietest place is reserved for those who wish to cleanse their mind of the noise over a cup of tea or coffee. This place is called Reaching Out Tea House. Housed in an ancient building, this entire place is run by people with hearing disability. They serve only boutique teas and coffees, so the prices are a bit on the higher side. 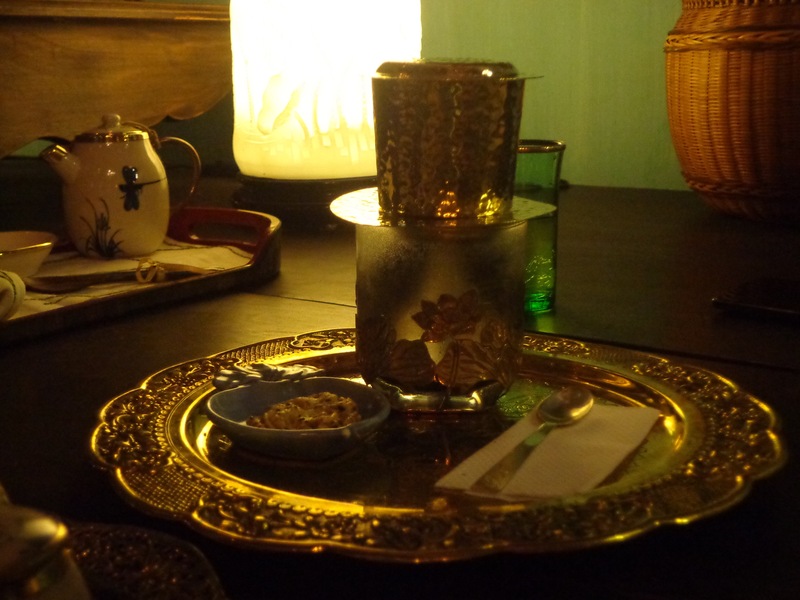 I had their local Jasmine tea and I can’t praise it enough. The tea tastes better when the leaves are soaked in hot water for the second time. The harshness from the first dip is washed off and what’s left is a nice, soothing and aromatic tea. These girls run the front of the house. They have put a lot of thought in the operational mechanism. Hence, communication isn’t an issue. For example, the ordering form is a simple fill in the box type of checksheet. There are set phrases that one can use to communicate. If you want to convey something a bit more complex, there is always pencil and cardboard. 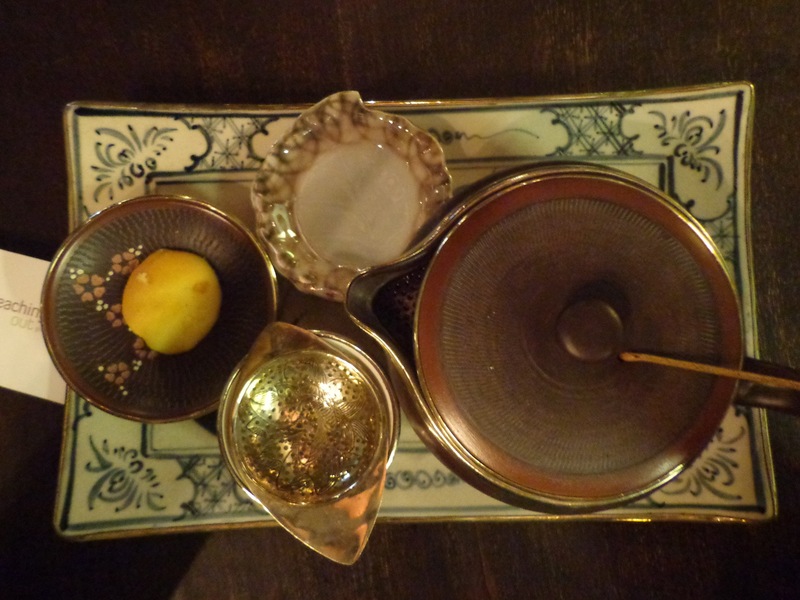 Jasmine tea served in a traditional tea set. Nandy ordered their Arabica coffee. He said that it was much different from what he has been tasting for the last few days. We left a note thanking them for their hospitality on the cardboard provided to us. 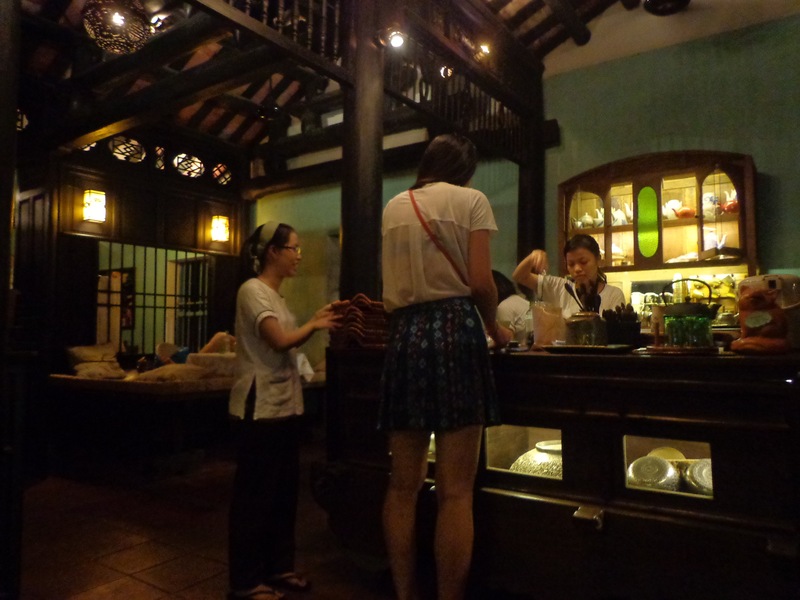 In another ancient building near the Reaching Out Tea House is a family run restaurant with an open kitchen. They only have very few items on the menu – the items and their descriptions do not even spill beyond the second page. I had a Cao Lau. Their version of Cao Lau was much better than the one Nandy had on the streets yesterday. Being an outsider, I cannot judge which is the more authentic of the two. 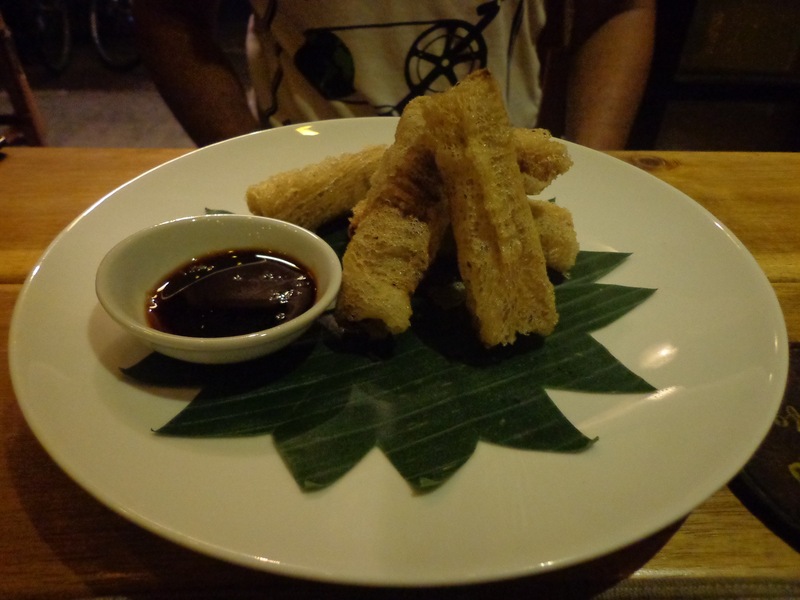 The story says that the original recipe is a closely guarded secret and it cannot be reproduced outside Hoi An because of the unavailability of some special kind of water (!). 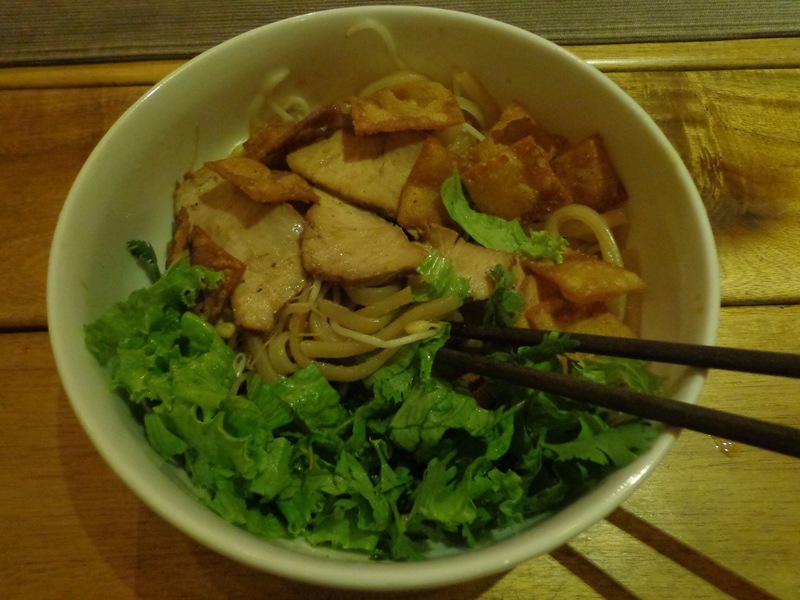 Cao Lau of Hoi An. Nandy ordered a platter of starters. The platter had White Roses. They tasted different from the ones I had yesterday. 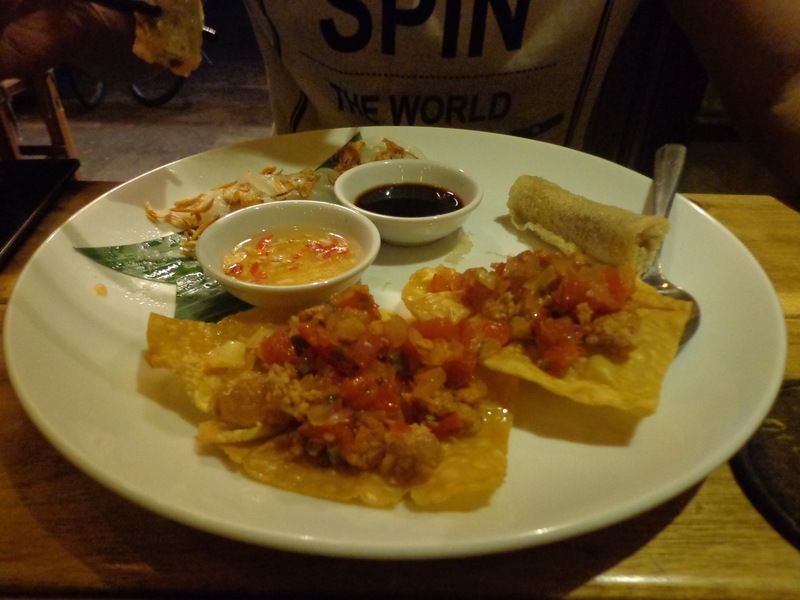 Nandy liked the duck spring rolls on the platter so much that he ordered an entire portion of it.